Alternaria alternata (Fr.) Keissl. and Alternaria tenuis. It is a seedborne and soilborne disease considered serious in parts of Bangladish and India. Water soaked, small, circular and purple lesions surrounded by chlorotic tissues on leaflets. Lesions later turn brown to dark brown. 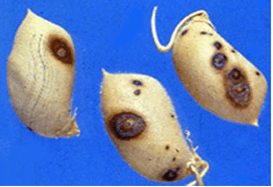 Circular, slightly sunken and irregularly scattered lesions on the pods. Affected pods turn dirty black. The pods contain shrivelled seeds. Alternaria alternata has a wide host range, causing leaf spots and blights on many plant parts. Alternaria alternate survive the intercropping period on infected canola stubble, on cruciferous weeds and, to a lesser extent, on seed. Seed infections can cause seedlings to rot (refer to damping-off section) resulting in a seedling blight that reduces plant establishment. Initial crop infections are caused by wind blown spores. Spores remain intact on susceptible plants until moisture from dew or rain allows them to penetrate into the tissue and cause a lesion. These lesions produce further spores and infections can then be spread throughout the crop by either the wind or rain. Mild, humid conditions favour disease development and the disease cycle will continue throughout the season under favourable conditions. 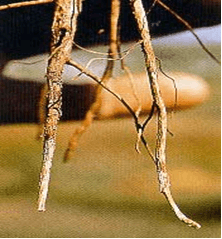 Hot and dry conditions interrupt epidemics as the absence of moisture greatly reduces spore production. Major outbrat ICARDA eaks are not common in Australia as weather conditions are normally hot and dry throughout podding which is unfavourable for prolonged infection. At ICARDA – Blotter test. At ICRISAT – Not specifically tested. Use wider spacing between plants. Use mancozeb at the rate of 3 g\l. Use carbandazim at 1.5 g\l. 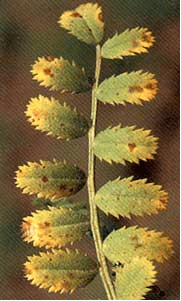 Ascochyta rabiei is recognized as the main biotic constraint facing winter chickpea, if favourable conditions (wet weather and mild temperatures) prevail. The disease can spread in epidemic form and results in 100% yield loss, especially on local non-improved cultivars. This disease is usually first noticed in late winter when small patches of blighted plants appear throughout the paddock. The disease spreads during cool, wet weather from infected plants to surrounding plants by rain splash of spores. This creates large blighted patches within crops. Initially ascochyta blight appears on the younger leaves as small water soaked pale spots. These spots rapidly enlarge under cool and wet conditions, joining with other spots on the leaves and blighting the leaves and buds. Small black spots (pycnidia), less than 1 mm in diameter, can be seen in the affected areas. In severe cases of infection the entire plant dries up suddenly. Elongated lesions can often form and girdle the stem. The stem may die and break off. Regrowth may occur from the broken stem. Affected areas on the pods tend to be round, sunken, with pale centers and dark margins. The fungus can penetrate the pod and infect the seed. Severe pod infection usually results in reduced seed set and infected seed. When infected seeds are sown, the emerging seedlings will develop dark brown lesions at the base of the stem. Affected seedlings may collapse and die (damping-off). This fungal disease has an asexual and sexual stage; the asexual stage is most common. In this stage the fungus survives mainly on infected seed and on crop residues. Spores of the fungus produced on crop residues can be carried to new crops by wind. 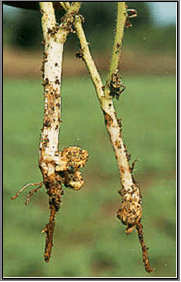 Infection can occur at any stage of plant growth, provided conditions are favourable. Moisture is essential for infection to occur. During wet weather, the disease can spread further than in dry conditions because spores of the fungus are carried onto neighbouring plants by wind and rain splash. At ICARDA – Malt Extract Agar. At ICRISAT – Keep the surface sterilized seeds (with 1% sodium hypochlorite for ten minutes) on potato dextrose agar and incubate for seven days at 22°C with 12 hr photoperiod. Examine for typical colony characteristic of A. rabiei (Haware et al. 1986). Crop rotation. Since only chickpea is susceptible to Ascochyta blight caused by A. rabiei, inclusion of non-host crops in the rotation will bring about a reduction in the inoculum level. Chickpea should not be grown more frequently than every 3-4 years. Furthermore, new crops should not be grown near fields that were infested with blight in the previous year due to the risk of infection by airborne ascospores. Tillage. Under most conditions, deep ploughing will hasten decomposition of infected chickpea straw and remove it as a source of inoculum. Studies conducted in the Palouse Region in Washington State showed that the pathogen survived in naturally infected plant material for more than two years when situated on the soil surface, but lost its viability rapidly at soil depths of 10-40 cm. All infested crop residues and volunteer plants should therefore be destroyed by thorough tillage and proper crop rotation. Fungicide application. Growers should take special care to protect green and healthy foliage during pod filling, especially if blight symptoms appear and increase in severity. Tests with application of Bravo 500 at different crop stages have shown that spraying at early podding reduced pod damage and markedly increased seed yields in the moderately resistant cultivars. Foliar fungicide applications may not prove cost effective when disease pressure is low. Thiram-based fungicides are registered for the treatment of grey mould infected seed. While seed treatment can improve establishment, it does not provide any protection from airborne infection later in the crop. At ICARDA – Late planting, destroying seed if the seed is showing symptoms and is heavily infected, and fungicide seed treatment for seeds not showing symptoms. At ICRISAT – So far not detected. Haware MP, Nene YL, Mathur SB. 1986. 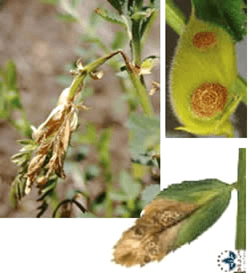 Seedborne diseases of chickpea. Technical Bulletin No. 1. Copenhagen, Denmark: Danish Government Institute of Seed Pathology for developing countries. 32pp. Botrytis cinerea Pers. Ex Fr. Botryotinia fuckeliana (de Bary) Whetzel (teleomorph). Botrytis gray mould is the most important disease affecting chickpea in the eastern Terai region of Nepal and is responsible for the complete failure of the crop with estimated yield loss of 15% in farmers’ fields (Chaurasia and Joshi 2001). More than 80% crop loss has been reported in Bangladesh and North-western India. However, under favourable conditions yield losses up to 95% have been reported (Pande et al. 2002). Botrytis gray mould is usually seen at flowering and symptoms develop on the stems, flowers, leaves and pods as grey or dark brown lesions. The grey fungal growth is evident on the flowers and the petioles if observed in the early morning. Drooping of the affected tender terminal branches is a common field symptom. In cloudy weather flower drop and rotting of plant parts are common. Under favourable weather conditions brown spots develop on the leaflets and circular to elongated spots formed on the branches. Sometimes, tiny black sclerotial masses appear on the dead tissue. On the infected plants either no seed set or only shrivelled seeds appear. On infected pods, lesions are water soaked and irregular in shape, and black sclerotial bodies are seen (Haware et al. 1992). Vitis vinifera (grapevine), Chrysanthemum x morifolium (chrysanthemum (florists’)), Malus pumila (apple), Pyrus communis (European pear), Phaseolus (bean), Brassicaceae (cruciferous crops), Allium cepa (onion), Cucumis sativus (cucumber), Helianthus annuus (sunflower), Hibiscus cannabinus (kenaf), Lactuca sativa (lettuce), Linum usitatissimum (flax), Lycopersicon esculentum (tomato), Pisum sativum (pea), Rosa (rose), Allium fistulosum (Welsh onion), Arachis hypogaea (groundnut), Brassica rapa subsp. pekinensis (Pe-tsai), Carthamus tinctorius (safflower), Chrysanthemum (daisy), Cicer arietinum (chickpea), Calendula officinalis (Pot marigold), Capsicum (peppers), Phaseolus vulgaris (common bean), Sesbania cannabina (corkwood tree), Solanum melongena (aubergine), Triticum aestivum (wheat), Vicia faba (broad bean), Vicia sativa (common vetch) and Zinnia elegans (Zinnia). Botrytis grey mould is a serious disease in parts of Bangladesh, India, Nepal and Pakistan. It has also been reported in Argentina, Australia, Canada and Chile. The mycelium of B. cinerea is septate, brown, hyphae being 8-16 m wide. The conidiophores are light brown, septate, erect and their tips are slightly enlarged bearing small and pointed sterigmata. The conidia are hyaline, 1-celled, oval and are borne in clusters on short sterigmata. The conidia in mass are ash-grey in colour, and measure 4-16 4-20 m. The disease is transmitted by the seedborne fungus from location to location. At ICRISAT – Pre-export field inspection and blotter test. At ICARDA – Culture on PDA. Seed treatment with a mixture of 25% carbendazim and 50% thiram at 2.5 g kg-1 seed (Pande et al. 2002). At ICRISAT – Rejection of the infected seed samples. At ICARDA – Seed treatment. Ahmed KM, Ravinder Reddy Ch.1993. A Pictorial guide to the identification of seedborne fungi of sorghum, pearl millet, finger millet, chickpea, pigeonpea and groundnut. Information Bulletin No. 34. Patancheru, A.P. 502 324 India: International Crops Research Institute for the semi-Arid Tropics. 200 pp. Chaurasia PCP, Joshi S. 2001. Management of Botrytis gray mold of chickpea at Tarahara, Nepal. Nepal Agricultural Research Journal 4 & 5:37-41. Haware MP, Faris DG, Gowda CLL, editors 1992. Botrytis gray mold of chickpea: summary proceedings of the BARI/ICRISAT Working Group Meeting to discuss Collaborative Research on Botrytis Gray Mold of chickpea, 4-8 March 1991. Joydebpur, Bangladesh; Patancheru, A.P. 502324, India: International Crops Research Institute for the Semi Arid Tropics, 23pp. Pande S, Singh G, Narayana Rao J, Bakr MA, Chaurasia PCP, Joshi S, Johanson C, Singh SD, Kumar J, Rahman MM, Gowda CLL. 2002. Integrated management of botrytis gray mold of chickpea. In: Information Bulletin No. 61. Patancheru, Andhra Pradesh, India. International Crops Research Institute for the Semi Arid Tropics, 32pp. Colletotrichum dematium (Pers ex Fr) Grove. Colletotrichum bakeri, Colletotrichum brassicae, Colletotrichum lysimachiae, Colletotrichum pucciniophilum, Colletotrichum sanguisorbae, Colletotrichum volutella. Anthracnose is of minor importance in chickpea growing areas. Small water soaked yellowish spots appear on the lower leaves which later turn into circular brown lesions with yellow margin 1-3 mm in diameter. In some cases lesions enlarge rapidly, become irregular and cover the entire leaflet, and extend to the stipules and stems. Lesions on pods are circular to elongate, and sunken at the centre. Plants wilt and dry due to severe infection (Nene et al. 1991). Anthracnose (Colletotrichum dematium) of chickpea: symptoms on (A) plant, Infected row (I), healthy row (H); (B) pods and (C) seed (photos: ICRISAT). Allium cepa (onion), Allium sativum (garlic), Arachis hypogaea (groundnut), Beta vulgaris (beetroot), Helianthus annuus (sunflower), Vicia faba (broad bean), Abelmoschus esculentus (okra), Cicer arietinum (chickpea), Capsicum annuum (bell pepper), Crotalaria juncea (sunn hemp), Glycine max (soybean), Lablab purpureus (hyachinth bean), Lycopersicon esculentum (tomato), Vigna radiata (bean, mung), Vigna mungo (black gram), Spinacia oleracea (spinach), Cyamopsis tetragonoloba (clusterbean), Gomphrena globosa (Globe amaranth), Medicago sativa (lucerne), Ricinus communis (castor bean) and Amaranthus hybridus (green amaranth). Anthracnose of chickpea: symptoms on (D) mycelial growth on seed; (E) acervuli on seed with setae and (F) conidia (photos: ICRISAT). Colletotrichum dematiumis worldwide in distribution, especially in several countries of Europe, Asia, Africa and Oceania. White mycelium is seen on infected plant parts and sometimes acervuli with black setae are also seen. Acervuli are circular, erumpent, dark brown to black, which scatter throughout infected part or aggregated, and in groups. Acervuli release conidia in pale yellow to grey masses. The colour of the acervular masses is pale to bright orange. Within the acervular masses numerous thick black, erect hair like spines or setae are seen. Setae are longer than the acervular masses. Conidia are hyaline, single-celled, measure 2.5-4 ´ 15-32 mm, fusoid and tapered at both ends. The disease is transmitted through infected seed and soil borne inoculum (Ahmed and Ravinder Reddy 1993). At ICARDA – Agar plate method. At ICRISAT – A minor disease and does not require any specific control measure. At ICARDA – Chlorothalonil used on lentils. Not known for chickpea. At ICRISAT – Incineration of infected plants and rejection of infected samples. Nene YL, Reddy MV, Haware MP, Ganekar AM, Amin KS. 1991. Field diagnosis of chickpea diseases and their control. Information bulletin no. 28, Patancheru, A.P. 502 324 India: International Crops Research Institute for the Semi-Arid Tropics, 52pp. Fusarium oxysporum f. sp. ciceri (Padwick) Snyd. & Hans. Fusarium wilt is prevalent in most chickpea growing countries and is a major disease of economic importance in Asian countries. Seeds harvested from infected plants are lighter and duller than those from healthy plants (Haware and Nene 1980). 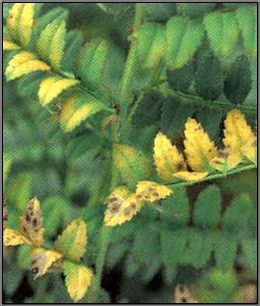 Chickpea foliage develops a greyish-green chlorosis, typically affecting lower leaves first and extending up the plant. Leaves eventually take on a dull-yellow colour, wilt and the plant collapses and dies. Adult plants wilt, with their petioles and rachises drooping. In some cases there may be leaf vein clearing before wilt begins. Internally, the xylem tissues stain dark brown to almost black. Wilting may initially affect only one side of the plant. Cicer arietinum (chickpea), Cajanus cajan (pigeon pea), Lens culinaris ssp. culinaris (lentil) and Pisum sativum (pea). Wide distribution. Fusarium wilt is a serious disease of chickpea in India, Iran, Pakistan, Nepal, Burma, Spain, Tunesia, Mexico, Morocco, Algeria and Syria (Haware 1990). F. oxysporum f. sp. ciceri can survive for many years either in soil as chlamydospores or as a saprobe in plant debris. Microconidia are borne on simple short conidiophores arising laterally on the hyphae. These are oval to cylindrical, straight to curved, and 5-15 ´ 2-5 µm, collecting in small, slimy droplets. Macroconidia 1-7 (mostly 3-5) septate, 25-55 ´ 2.5-6 µm, fusiform, curved, with a tapering, pointed, sometimes hooked, apical cell and distinctly pedicellate basal cell. Macroconidia arising from phialides similar to those forming microconidia except often in clusters, borne on irregularly branching cells. In some strains macroconidia are sparse, in others, abundantly produced in pinkish sporodochial conidiomata. Chlamydospores are globose, hyaline 7-15 µm diameter, usually forming abundantly in mature colonies, terminal or intercalary, single or in small groups or chains. Conidia are dispersed by water flow, rain splash and by movement of infected soil or plant material, especially seed. Following infection of host roots, the fungus crosses the cortex and enters the xylem tissues. It then spreads rapidly up through the vascular system, becoming systemic in the host tissues, and may directly infect the seed. At ICRISAT – Pre-export field inspection and blotter test, and for confirmation of the fungus agar plate method is used. Agar plate method includes surface sterilization of the seeds with 2.5% sodium hypochlorite for 2 minutes, plating the seeds on Czapeks agar (amended with 500 mg PCNB, 25 g malachite green, 750 mg strepto-penicillin, and 2 g yeast extract/liter), and incubating the seeds at 20°C under a 12 hr NUV/12 hr dark light cycle for 8 days (Haware et al. 1978). At ICARDA – Agar plate method, freezing blotter test. Seed treatment with 1.5 g-1 kg seed with benomyl + thiram (1:1 vol.) (Haware et al. 1978). (ICRISAT). The wilt incidence of chickpea caused by Fusarium oxysporum f.sp. ciceris was reduced by treating the seeds with fungicides (thiram, carbendazim, captan and mancozeb, 2 g/kg) and application of Trichoderma spp. (T. viride, T. harzianum, T. longiflorum and T. hamatum at 500 g/plot) to wilt sick soil. Use of resistant cultivars in combination either with the fungicidal seed treatment or soil application of Trichoderma spp. were significantly superior in minimizing wilt incidence over the control in both the years (1999-2000 and 2000-01). Good results were obtained in combination either with seed treatment, with fungicides or with biological control agents.(ICARDA). 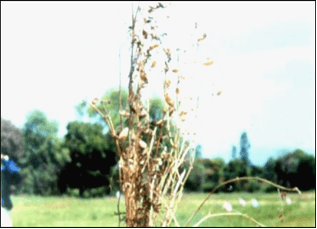 At ICRISAT – Rejection of the infected seed sample. At ICARDA – Crop rotation, seed treatment. Haware MP. 1990. Fusarium wilt and other important diseases of chickpea in Mediterranean area. CIHEAM-Options Mediterraneennes Seminar Series No.9:61-64. Haware MP, Nene YL. 1980. Influence of wilt at different stages on the yield loss in chickpea. Tropical Grain Legume Bulletin 19:38-44. Haware MP, Nene YL, Rajeshwari R. 1978. Eradication of Fusarium oxysporum f. sp. ciceri transmitted in chickpea seed. Phytopathology 68:1364-1367. Seed germination can be reduced by as much as 90% (Kmetz et al. 1978) since it is a seedborne disease. About 40% yield losses have been reported when planted with infected seeds (Wall et al. 1983). Infected seedlings become blighted and die. Those that survive have colourless or bright red to orange cotyledonary lesions that range in size from pinpoints to lesions that cover the whole cotyledon. Small reddish brown streaks, 1.5 cm long, form on hypocotyls. Senescent tissues are covered with minute, black pycnidia, usually arranged linearly on stems. Pycnidia are scattered on dry, poorly developed pods. They may also occur on mature pods. Severely infected seeds are shriveled, badly cracked, and frequently covered by white mycelium. Infected seeds could be a means of introducing the pathogen into new areas (Garzonio and McGee 1983). Glycine max (soyabean) and several others areAbelmoschus esculentus (okra), Abutilon theophrasti (China jute), Allium cepa (onion), Allium sativum (garlic), Arachis hypogaea (groundnut), Alysicarpus vaginalis (alyce clover), Capsicum frutescens (chili), Kummerowia striata (common lespedeza), Lotus corniculatus (bird’s-foot trefoil), Lupinus (lupins), Lycopersicon esculentum (tomato), Phaseolus acutifolius (tepary bean), Phaseolus coccineus (bean runner), Phaseolus lunatus (lima bean), Phaseolus vulgaris (common bean), Pisum sativum (pea), Trifolium pratense (purple clover) and Vigna unguiculata (cowpea). Widely distributed in Asia, Africa, Europe, America and Oceania. Fungal colonies are colourless, with black, spreading stromata. Pycnidia are black, solitary or aggregated, unilocular or multilocular, with prominent necks more than 200 µm long. Alpha conidia are hyaline, ellipsoid to fusiform, guttulate, and 5-9 ´ 1.5-3.5µm. Beta conidia, which are rarely formed, are hyaline and filiform, sometimes curved at the end. at ICRISAT – Not detected at ICRISAT. at ICARDA – Not applicable. at ICRISAT – Incineration of the infected crop and rejection of the infected seed samples. Garzonio DM, McGee DC. 1983. Comparison of seeds and crop residues as sources of inoculum for pod and stem blight of soybeans. Plant Disease 67: 1374-1376. Kmetz KT, Schmitthenner AF, Ellett CW. 1978. Soybean seed decay: prevalence of infection and symptom expression caused by Phomopsis sp., Diaporthe phaseolorum var. sojae, and D. phaseolorum var. caulivora. Phytopathology 68: 836-840. Wall MT, McGee DC, Burris JS. 1983. Emergence and yield of fungicide-treated soybean seed differing in quality. Journal of Agronomy 75:969-973. Phoma medicaginis Malbr. & Roum. Phoma leaf blight is of minor importance in India and elsewhere in the world (Haware and Nene 1981). Phoma leaf blight affects the crop in the reproductive stage. The field symptom is the patches of drying plants. Lesions are irregular, light brown on the leaves, stems and pods with dark margins. Dark, minute, submerged pycnidia are irregularly scattered in the infected tissue. Seeds from the infected plants are discolored and shriveled (Nene et al. 1991). Glycine max (soyabean) and several others areAbelmoschus esculentus (okra), Abutilon theophrasti (China jute), Allium cepa (onion), Allium sativum (garlic), Arachis hypogaea (groundnut), Alysicarpus vaginalis (alyce clover), Capsicum frutescens (chilli), Kummerowia striata (common lespedeza), Lotus corniculatus (bird’s-foot trefoil), Lupinus (lupins), Lycopersicon esculentum (tomato), Melilotus alba, Phaseolus acutifolius (tepary bean), Phaseolus coccineus (bean (runner)), Phaseolus lunatus (lima bean), Phaseolus vulgaris (common bean), Pisum sativum (pea), Strophostyles helvola, Trifolium pratense (purple clover) and Vigna unguiculata (cowpea). It is a minor disease reported from Australia, Bangladesh, India and USA. The mycelium is dark gray to black. Hyphae are thick, branched and have rough surfaces. Pycnidia arise singly or in aggregate masses with extremely variable shapes, 200-300mm in diameter, usually globe to subglobose. Conidia are hyaline to pale yellow, aseptate, straight, 4.5-8.0 ´ 2-3 mm and guttulate. Chlamydospores are small, thick, dark brown to black, spherical to irregular with smooth to rough surfaces. They may be terminal or intercalary, formed in chains (Nene and Reddy 1987). Disease spreads through infected seed from location to location. at ICRISAT – Pre export field inspection and blotter test are used. at ICARDA – Use certified seed; disease resistant cultivars; crop rotation and spring burning when severe. Haware MP, Nene YL. 1981. 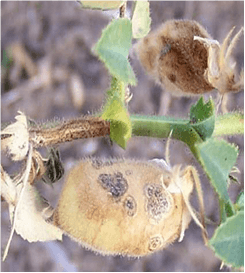 Phoma blight – a new disease of chickpea. Plant disease 65 : 282. Nene YL, Reddy MV. 1987. Chickpea diseases and their control. Pages 233-270 in The Chickpea (Saxena MC and Singh KB, eds.) Wallingford, Oxon, UK: CAB International. Spot-causing fungal disease occurring in leaf. The lesions are at first water-soaked small spots and then become blackish brown lesion divided by leaf veins. The lesions often extend from the leaf rim, fuse with the adjacent lesion, and become large. The leaf shrinks and withers in results. The diseased leaf defoliates at the early stage. The species of the causal organism is same with leaf spot fungi of alfalfa, but the pathogenicity is differentiated. On a wide range of hosts including apple, ash, broad bean, clover, endive, gladiolus, gramineae, lettuce, lupin, muskmelon, onion, Onobrychis, Medicago sativa, mangold, tomato, Trifolium, Vicia. Worldwide; very common in temperate and sub-tropical regions. Survival: The fungi are carried-over on infected plant debris (leaves and stems), seed and in the soil. Environmental conditions: Stemphylium leaf spot may develop under warm moist conditions. Dispersal: Spores of these fungi are spread by wind and rain splash. Generally air-borne as ascospores or conidia. These penetrate the leaf or petiole via stomata. May also occur on seeds and in soil. Control measures include crop rotation, use of less susceptible varieties and hybrids, and pre-sowing treatment of seeds. 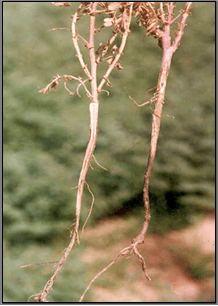 Charcoal rot is a disease of the soybean root and stem as well as other crops. Charcoal rot symptoms vary depending on the time of the year that the plant is infected. Usually charcoal rot is develops later in the season but it can cause a seedling disease since the roots of the plant can be infected anytime during the season. Infected seedlings show a reddish brown discoloration at the soil line extending up the stem that may turn dark brown to black. Foliage of infected seedlings can appear off-color or begin to dry out and turn brown. A twin-stemmed plant may develop if the fungus kills the growing point. Under cool, wet conditions young plants that are infected may survive but carry a latent infection that will express symptoms later in the season with hot, dry weather. In older soybeans symptoms of charcoal rot include early maturation, non-abscission of the leaves, chlorosis and failure to complete pod filling. Microsclerotia can be visible as black specks in the woody parts of the stems and roots. The microsclerotia are released into the soil as infected tissue decays. M. phaseolina infects over 500 plant species and has a wide geographic distribution. Major cultivated hosts include: Arachis hypogaea (peanut), Beta vulgarius, Brassica oleracea (Cabbage), Capsicum annuum (pepper), Cicer arietinum (chick pea), Citrus spp. Corchorus sp., Cucumis spp., Fargaria sp., Glycine Max (soybean), Gossypium sp., Helianthus annuus (sunflower), Ipomoea batatas (sweet potato), Medicago sativa (alfalfa), Phaseolus spp., Pinus spp., Prunus spp., Sesamum indicum (sesame), Solanum tuberosum (potato), Sorghum bicolor (sorghum), Vigna unguiculata (cowpea), and Zea mays (corn). Australia, Ethiopia, India, Iran, Myanmar, Nepal, Pakistan, Turkey, USA. M. phaseolina survives as microsclerotia in the soil and on infected plant debris. The microsclerotia serve as the primary source of inoculum and have been found to persist within the soil up to three years. 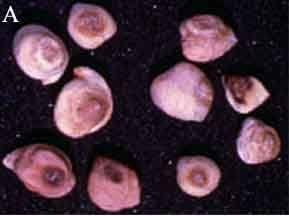 The microsclerotia are black, spherical to oblong structures that are produced in the host tissue and released in to the soil as the infected plant decays. These multi-celled structures allow the persistence of the fungus under adverse conditions such as low soil nutrient levels and temperature above 30ْ C. Microsclerotial survival is greatly reduced in wet soils surviving no more than 7 to 8 weeks and mycelium no more than 7 days. Seeds may also carry the fungus in the seed coat. Infected seed do not germinate or produce seedlings that die soon after emergence. Germination of the microsclerotia occurs throughout the growing season when temperatures are between 28 and 35 C. Microsclerotia germinate on the root surface, germ tubes form appresoria that penetrate the host epidermal cell walls by mechanical pressure and enzymatic digestion or through natural openings. The hyphae grow first intercellularly in the cortex and then intracellularly through the xylem colonizing the vascular tissue. Once in the vascular tissue M. phaseolina spreads through the taproot and lower stem of the plant producing microsclerotia that plug the vessels. The rate of infection increases with higher soil temperatures and low soil moisture will further enhance disease severity. Hot, dry weather promotes infection and development of charcoal rot. In soybean charcoal rot is a greater problem after anthesis and often occurs when the plant is under drought stress. M. phaseolina can grow and produce large amounts of microsclerotia under relatively low water potentials allowing this disease to be recognized as favoring drought. The mechanical plugging of the xylem vessels by microsclerotia, toxin production, enzymatic action, and mechanical pressure during penetration lead to disease development. The population of M. phaseolina in soil will increase when susceptible hosts are cropped in successive years and can be redistributed by tillage practices. Fields having the history of severe incidence may be avoided. Deep ploughing of chickpea fields to bury debris. Use clean certified seeds treated with PCNB and Thiram (1:1) @ 2.5 gm/kg of seeds. Practice crop rotation with wheat and oat which helps in reduction of inoculum. Sowing should be done on rows with wider spacing. Irregular, light brown lesions on the leaves, stems, and pods have dark margins. Seeds from infected pods are discolored and shrivelled. Lesions on the leaflets consist of roughly ovoid necrotic spots. The spots are dark brown at the center with a broad gray border. Minute, dark brown, elongated spots also develop on the stems. Cicer arietinum (chickpea), clover (trifolium). Widespread: Africa, Asia, Australia, Europe, North and South America. Excessive vegetative growth, high humidity, and cool weather (15-20C) favour disease development. Usually affects the crop from the flowering stage onwards. A minor disease and does not require any specific control measure.